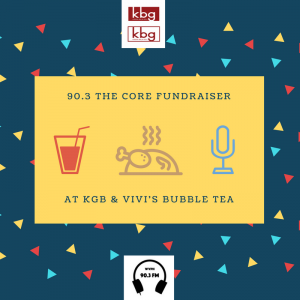 90.3 FM the Core | 90.3 The Core Fundraiser at KBG & Vivi Bubble Tea! 90.3 The Core Fundraiser at KBG & Vivi Bubble Tea! Come out to support 90.3 The Core by grabbing some grub & tea at Korean Barbecue Grill in New Brunswick! Just mention The Core and a portion of your purchase will go to your favorite radio station (which is us, obviously). This counts for both KBG and Vivi Bubble Tea!